"MY TIME AT GRADUATE FASHION WEEK...."
Last month on the 5th June myself and one of my friends travelled down to London to attend this years Graduate Fashion Week. For anyone who doesn't know what GFW is about, it represents the leading fashion universities and showcases the work of over 1,000 students and graduates. Having your work walk down the catwalk here has enormous potential to launch anyones career in the industry. GFW were celebrating their 25th anniversary which promised to be a very exciting event. The Truman Brewery was to be the venue this year, just a short walk from Liverpool Station which made it a very simple journey from the moment we reached Kings Cross Station. Once we had arrived and found our seats we waited for the show to begin, just by being in the atmosphere you could anticipate how eager and excited the audience were for things to get under-way. 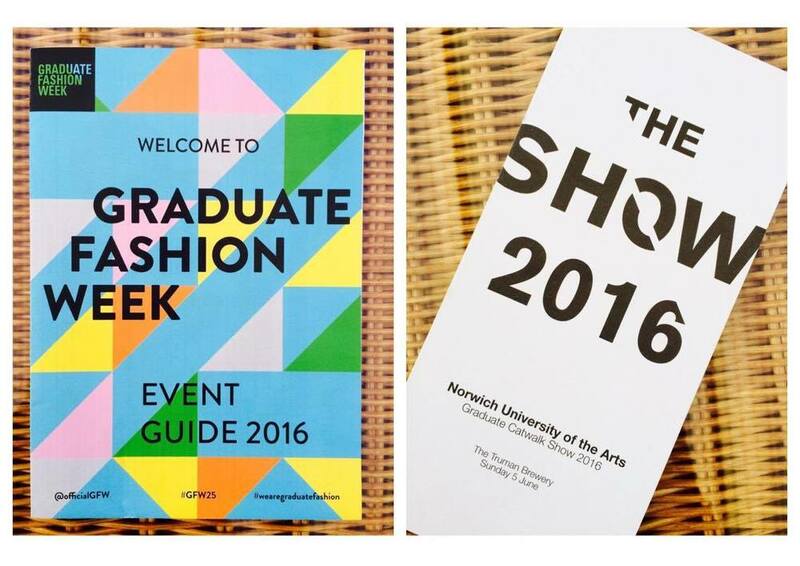 Kicking off this years GFW were the graduates of 'The Norwich University of Arts'. We were treated to a wide range of styles and designs which offered a variety of inspiration to all the audience. Elegant origami pieces were certainly not to be missed from the show, the exquisite attention to detail put them in a complete class of their own. The menswear came down the catwalk with its own statement to make in the show, with the oversized trousers being disciplined by the shirts helped create a refined composure to the outfits. Faux fur was also featured in the show and it demanded to be seen by the creative and bold use of colour which really brought something new to the table. Each designer presented their collections in a unique and diverse way, from the added accessories to the genre of music used, the collections that came down the catwalk at this show made a stamp on each of the designers identity. The show was a representation of the raw talent which lies within 'The Norwich University of Arts' and gave an insight into one of the next generations in the fashion industry. The entire GFW building was a hive of creativity and style (any fashionista's dream), the walls were covered in illustrations and photography, portfolios from students were on display filled with drawings and samples and talk-spaces were held throughout the day. Being here I felt a general sense of the fashion community which had gathered here to witness some of the future upcoming figures in the fashion world, I look forward to returning here next year! Designers: Grace Barnes, Sydney Clark, Alice Potts, Madara Rozensteina, Daina Eicaite, Sian Louise Fossey, Hamish Devereux-Batchelor, Jack Rowan Thorne, Joanna Hammond, Emma Wang, Emily Lavarello, Amerlia Foreman, Christina Mitropoulou, Sophie Wilton, Yee Ki Ng, Nicholas Edward Stanley.